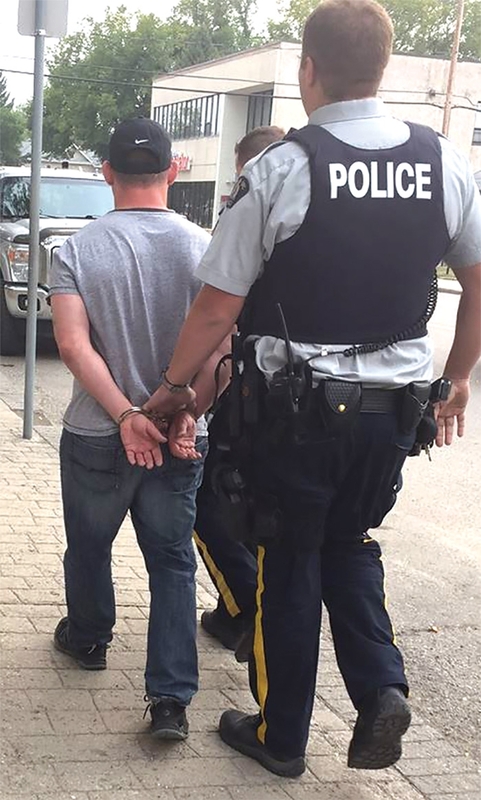 Steven Wuelfrath was arrested by Moosomin RCMP Wednesday, Sept. 13. At right, cash and a computer reported stolen were among many items retrieved by Moosomin RCMP from Wuelfrath’s vehicle. Moosomin RCMP officers—with the help of a vigilant local resident—stopped a cross-country crime spree with the arrest of Steven Wuelfrath, 46, of B.C. Wuelfrath has been held in custody since his arrest Sept. 13. Images of Wuelfrath were captured on security camera when a laptop was stolen from Glasser’s TV Service in Moosomin in August. When he returned to Moosomin Sept. 13 and entered another store, police received a call from someone who recognized him from photos. “A switched-on member of the public recognized the suspect from the previous photos and videos we had put out, and called to tell us he was at Family Foods here in town,” Sgt Scott Fefchak of the Moosomin RCMP explains. “Cpl Fleming and Cst Berkshire blasted over there ASAP and they arrested him without incident. They got the vehicle he was driving, which was a B.C.-plated vehicle. “We had that vehicle towed to the office to secure in our secure bay. The night shift came in and Cst Maxwell wrote a search warrant for the vehicle because there were indications there was other stolen property in there. The items recovered from the vehicle had been reported stolen from communities right across the country. “From Revelstoke there was a Mac computer,” says Fefchak. “From Swift Current there was a phone and some electronics that were stolen. The laptop from Moosomin was found in there, a generator stolen from Sault Ste. Marie, a laptop from Fredericton New Brunswick, and some golf clubs from Halifax. “He’s also charged with seven counts of possession of stolen property, because all those things we found were listed on the police system as stolen,” said Fefchak. The stolen items will be returned to their owners. Many of the stolen items retrieved in this case were still in their packages. Fefchak said it appears that Wuelfrath started his crime spree in B.C., headed east, and was on his way back home when he was in Moosomin and was spotted. Fefchak says the arrest shows the value of the police sharing information with the public that can help find suspects. “It goes back to police releasing photos of suspects or people of interest in crimes,” he said. “Through the media like you guys or through social media, and people paying attention and calling us when they see these people whose photos have been out there. “That’s us all working together. That’s what solved this—everyone working together. “It wasn’t the police on their own, it wasn’t any one person on their own, it was a sequence of events. It worked the way it’s supposed to work. When police are releasing information that they can to try to solve crime, and when the public are engaged, and paying attention and helping us out, that’s how this thing works.